The first time I read the following poem was when a nice gentleman in Church gave me a card with the poem on it. I posted it on Catholic Homeschooling site a few years ago. It was recently after he passed away, that I learned his name. Thank you Eric! The way mother does to me. Did you try telling Him stories of the world? And, oh, did He cry? Just little things that happen? And do the angels wings make a noise? Can He hear me if I speak low? Does He hear me now? CLICK HERE to read what Fr. 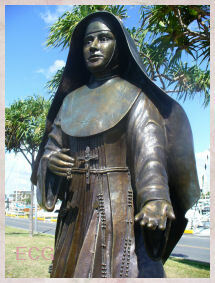 Robert Fox has written on subsequent appearance by the Blessed Mother to Sister Lucia. Qui apud Iordanem baptizatus est. Qui ipsum revelavit apud Canense matrimonium. CLICK HERE for the rest of the prayers. "Take advantage of your sufferings and more so of the small ones than of the great. God considers not so much what we suffer as how we suffer. To suffer much, yet badly, is to suffer like reprobates. To suffer much, even bravely, but for a wicked cause, is to suffer as a martyr of the devil. 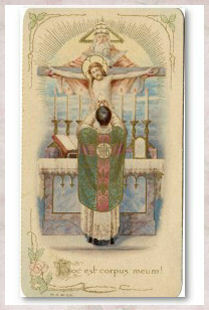 To suffer much or little for the sake of God is to suffer like saints". "If it be right to say that we can choose our crosses, this is particularly true of the little and obscure ones as compared with the huge, conspicuous ones,for proud human nature would likely ask and seek for the huge, conspicuous crosses even to the point of preferring them and embracing them. But to choose small, unnoticeable crosses and to carry them cheerfully requires the power of a special grace and unshakable fidelity to God. Do then as the storekeeper does with his merchandise: make a profit on every article; suffer not the loss of the tiniest fragment of the true Cross. "It is a priceless treasure which is inspired by God." The Rosary is made up of two things: mental prayer and vocal prayer. In the Rosary mental prayer is none other than meditation of the chief mysteries of the life, death and glory of Jesus Christ and of his blessed Mother. Vocal prayer consists in praying the decades of the Hail Mary, each decade headed by an Our Father, while at the same time meditating on and contemplating the principal virtues which Jesus and Mary practised in the mysteries of the Rosary. 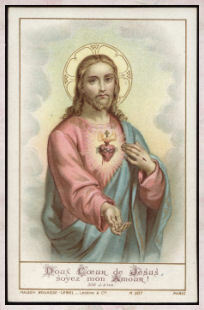 For more information on the Rosary and for a Scriptural Rosary complete with pictures, please be sure to visit the The Holy Rosary Page of my Catholic Homeschooling website. ST. LOUIS — Sen. Claire McCaskill was disinvited from speaking at her daughter's Catholic high school commencement because her positions on abortion and embryonic stem cell research are at odds with those of the church. Students at St. Joseph's Academy in the St. Louis suburb of Frontenac wanted to have McCaskill speak at their graduation this month, McCaskill spokeswoman Adrianne Marsh said Tuesday. But the offer was rescinded last week. The senator was told by the school that the decision came from St. Louis Archbishop Raymond Burke, Marsh said. 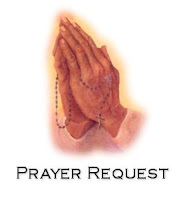 Please pray and continue to keep in your prayers, homeschooling mom Heather who is undergoing brain surgery today. Also, please pray for Heather's family. H/T to Un-Muted Mumblings, a new blog I found today. 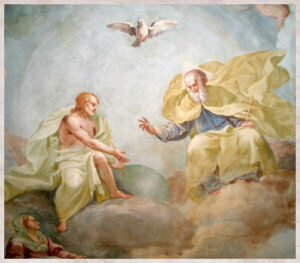 CLICK HERE for a great collection of Catholic works. You'd be surprised at what you can find there. I know I was. I will be permanently posting their link on my sidebar. I thought this was beautiful. Hope you enjoy. Spring is here and no doubt most of you are planning your gardens. Since we are in the month dedicated to the Blessed Mother of God, why not make a Mary's Garden? All white flowers represent the Blessed Mother's purity and holiness. One such flower that you can plant would be white snowdrops. The White Lily is to remind us of the Visitation of Our Lady. The rose is the flower most associated with the Blessed Mother because it is believed to be the first that blossomed at Our Savior's birth, closed at His crucifixion and reopened at the first Easter Sunday. Roses are also a symbol of God's love. 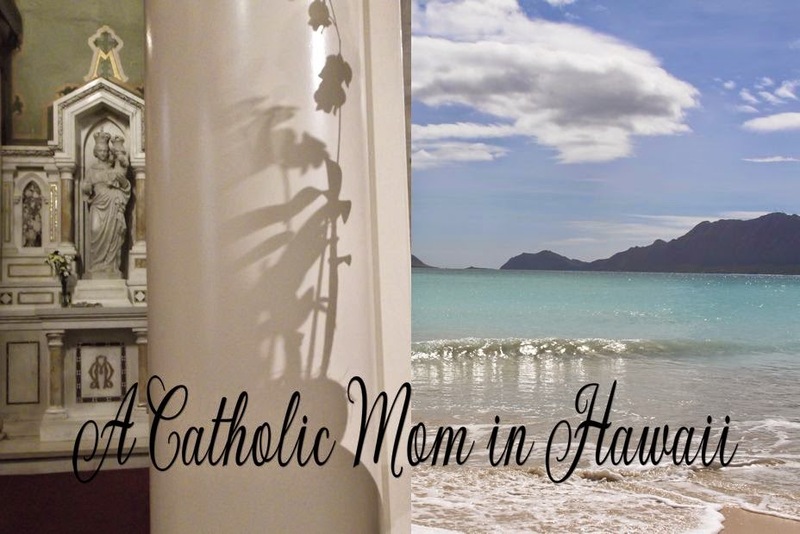 "One of the most picturesque rose miracles is the creation of the rosary, which is found in the early history of almost every Christian Country. 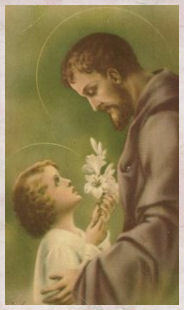 The story is told and retold of the young man who made the Virgin an offering of 150 roses each day. The roses he wove into a wreath for her altar. Eventually he became a monk in an austere order, and in his new way of life it bothered him that he had neither time nor opportunity to continue performing the devotion to his adored Lady. 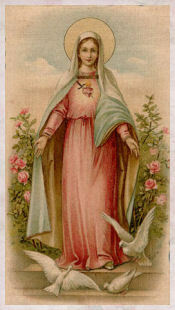 The abbe whom he consulted advised him, instead to say 150 Aves to the Blessed Virgin each day, assuring him that they would be just as acceptable to her as his daily offering of roses. Thereafter at a certain hour each day, the young man knelt at the altar of the Blessed Virgin repeating the required number of Aves". 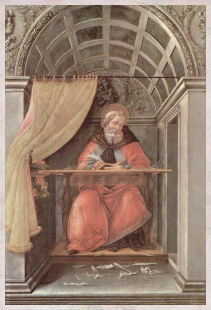 Daffodil's are in remembrance of the Annunciation. 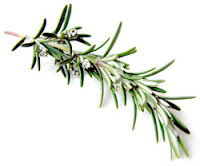 Rosemary. Legend has it that the flowers of this plant were originally white. However, they turned blue, the color associated with the Blessed Mother's color,"in reward for service it offered when Our Lady looked for some bush on which to spread her sky-blue gown on her way from Bethlehem". Thistle. Our Lady's thistle has green leaves spotted with white caused by some drops of the Virgin's milk flowing upon them. 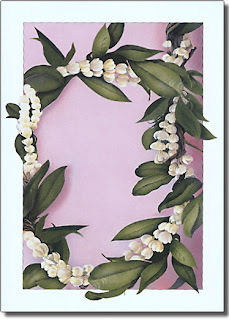 Lily-of-the-Valley is sometimes called Our Lady's Tears. It is the favorite flower in many countries to decorate her shrine for the Feast of the Annunciation on March 25th. Foxglove. 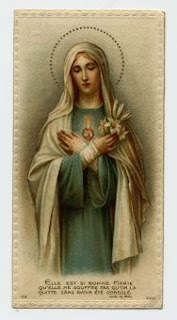 The bell-shaped flowers cover with small blank dots is called Our Lady's thimble. Snowdrop. This delicate flower blossoms early in the spring, sometimes between patches of melting snow. Little bouquets of snowdrops are the first floral tribute of the year to shrines of the Madonna. Lily. This stately dignified flower has been associated with Jesus and Mary since early times. 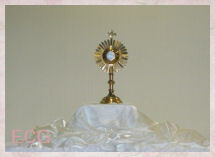 It is used at Easter to symbolize radiance of the Lord's risen life. The first of May is quite a day of celebrations! 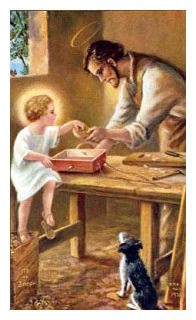 First off, it is a day dedicated to St. Joseph the Worker. In Hawaii we celebrate Lei Day with the beautiful leis that the skillful lei makers make every day of the year. 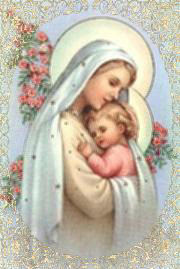 But my favorite celebration is the first day of the month dedicated to our Blessed Mother! I will try very hard to post items of Marian interest in honor of the Blessed Virgin Mary. 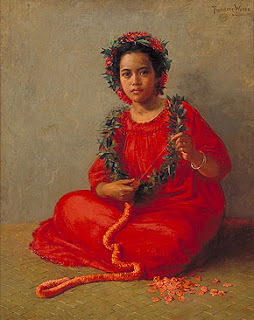 This is a painting of a Lei maker that hangs in the Honolulu Academy of Arts. For a Christian to pray is not to evade reality and the responsibilities it entails,but to assume them to the end,trusting in the faithful and inexhaustible love of the Lord. 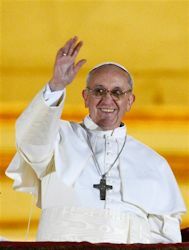 MEXICO CITY — The Roman Catholic Church on Sunday called on doctors in Mexico City not to perform abortions and lamented the city's decision to legalize the procedure in the first 12 weeks of pregnancy. The church has vowed to continue its anti-abortion campaign even through it is under investigation for possibly violating Mexican laws forbidding the church's participation in politics. Click Here for the Lair of the Catholic Cavemen's list. BTW, I know I have been blogging all day. I am so nervous right now...two hours before the Confirmation Mass. I think I am more nervous than Joey. Or could it be the four cups of tea and two cups of coffee I had today? Fr. Duffy lent me the Cardinal's book The Testimony of Hope a few years ago and I just devoured it. I remember how touched I was by a passage wherein the cardinal celebrated the Mass on the palm of his hand with a tiny piece of bread and a tiny bit of wine that somehow he was able to have smuggled to him by either a fellow prisoner or a sympathetic guard. 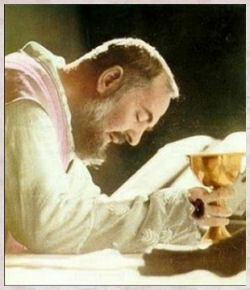 His hand became an altar for the Sacrifice of the Mass. ROME, APRIL 24, 2007 (Zenit.org).- The secretary of the Pontifical Council for Justice and Peace said Cardinal François-Xavier Nguyên Van Thuân's beatification process is about to begin, some five years after the Vietnamese prelate's death. Bishop Giampaolo Crepaldi made the announcement when presenting a book by Cardinal Camillo Ruini entitled "God's Truth and Man's Truth: Benedict XVI and the Great Questions of Our Time." The book is being published as a part of the Cardinal Van Thuân International Observatory's "Journals" series. Bishop Crepaldi explained: "The book urged me to link the theme of truth -- of God's and man's -- to which Cardinal Ruini's book is dedicated; and the theme of hope, so dear to the departed Cardinal François-Xavier Nguyên Van Thuân and at the core of his spirituality and his exemplary living of human and Christian life." The prelate, who worked with the cardinal and who is president of the Van Thuân Observatory, explained how "truth and hope have deep ties. The intelligence of faith leads me to the firm conviction that truth, in surrendering or uncovering itself, reveals a vocation and therefore brings about hope." 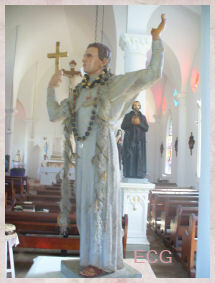 Bishop Crepaldi underlined the connection between the theme of the book and the Vietnamese cardinal, saying that it "is made even more immediate and meaningful by the fact that this year we will be remembering the fifth anniversary of his death, which occurred on Sept. 16, 2002, and the cause for his beatification is starting." Just tell her you are a Catholic. Yesterday, after Confession, I was walking in downtown. A lady approached me and asked me if I would like an Awake magazine. I replied "No, thank you. I am Catholic". Boy, she immediately stepped away quickly and said. "Okay, thank you". This isn't the first time that has happened. In fact, my brother's Southern Baptist father-in-law, will tell JWs he is a Catholic, so they will leave him alone. It feels really strange, but then again, we have to attend the last Mass for Sunday, the 5:30 a.m. Mass geared to the younger Catholics. It is the big day... the day of Joey and his group's Confirmation. They will be confirmed by our former pastor Fr. 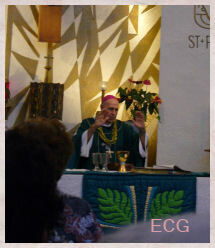 Marc Alexander, who is now the vicar general. These kids have been prepared by the InHim Ministries so my husband and I were confident Joey was in good hands. These young people from InHim have Stuebenville connections. How great is that? Hope to be able to post photos later. Apparently, this bishop, Biship Edward K. Braxton, of Belleville, Illinois wants to make sure an individual knows his or her faith before he or she is confirmed in the Catholic Church. 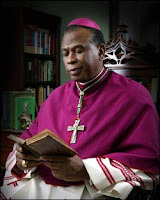 In other words, he is a bishop worthy of being a shepherd to the flock.